It’s never been easier to stay on top of your shipments. Our reporting and tracking features give you a bird’s eye view of past, current and future shipments. Stamps.com also gives your customers the ability to check the status of shipped packages without ever needing to call you. Need to track a package while you're on the road? No problem. Simply log on to the Stamps.com Customer Home page from any computer, click on "View History" and search by either date, recipient, cost code, tracking number, mail class, etc. If your package was sent with USPS Tracking or Signature Confirmation™ or is an Priority Mail Express® delivery you will see the USPS® tracking number as a clickable link. Click the link to see the latest package status information available from the United States Postal Service®. It's that easy. View mail classes by type. 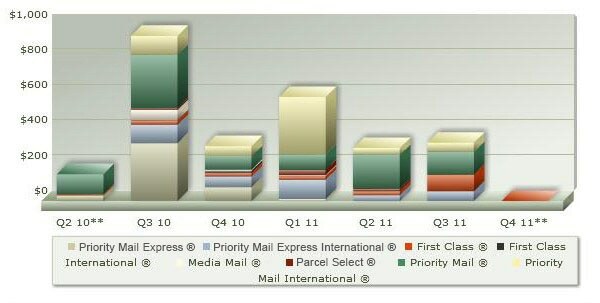 Track postage classes per quarter. 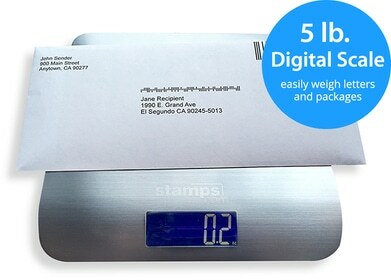 With Stamps.com, you can easily track how much you are spending on postage at an individual, departmental or organizational level. Did the package ship? With USPS Acceptance SCAN (Shipping Confirmation Acceptance Notice), you and your customers will always know the answer. All of your packages for the day are linked to one form and one barcode. The USPS scans the form at pick-up and the acceptance is automatically recorded in the USPS tracking system, greatly expediting the shipping process. When your customer checks the status of their package online, they will see confirmation that their package is on its way.